There is almost nothing more upsetting than working out in your garden or yard and being surprised by a snake that has taken up residence in your garden. Most of the snake repellents that you can buy in the stores use the chemical naphthalene, which can cause damage to the liver, cause anemia and has been classified by the Environmental Protection Agency as a Class C carcinogen. How Can You Tell if You Have a Snake Problem? When you have snakes in your yard, it is a sign of a healthy ecosystem. If you have a variety of animals, vegetation, and insects, then chances are you have, or will have, a snake in your yard. While most snakes are non-venomous, they can still be unsettling when you find them in your garden. So what repels snakes and how can you get rid of garter snakes, keeping them out of your yard and home? 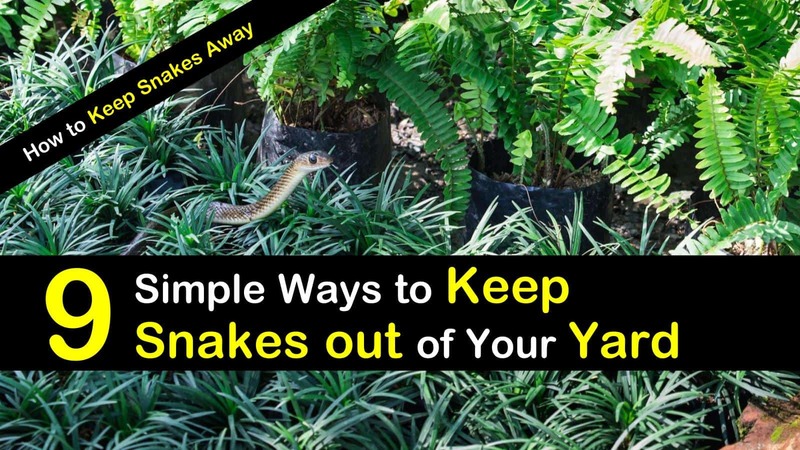 Here are simple ways for how to get rid of snakes from around your yard and in your home. 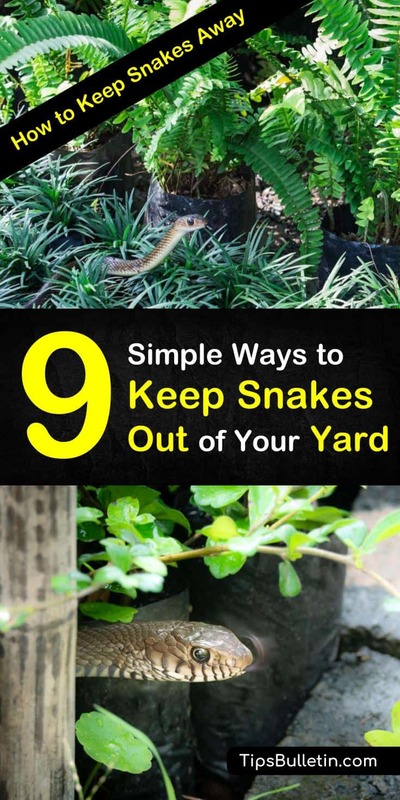 Do you want to know how to get rid of garden snakes? Well, the snakes entering your yard are merely trying to find a safe place to live that provides them with a steady food supply. When trying to keep snakes away from your yard and home, you have to make sure that you keep your yard and flower garden well maintained. To keep snakes from finding their way into your garden, you need to pull weeds, remove excess vegetation, and remove any piles of debris that make perfect places for snakes to hide. Keeping your lawn mown will not only help keep snakes out but will also assist in controlling mice and other pests. If you have a snake problem, you may want to know how to repel snakes? The easiest solution is by removing their food supply. Snakes will move past your house if you get rid of the rodents and insects that they like to have as snacks. Avoid using bird seed, nest boxes, and baths that attract mice and other rodents and make sure you clean up any fruits or nuts that may have fallen on your lawn. If you like to compost, make sure that you store it in a sealed container to keep the snakes and rodents away from your home. To keep snakes from getting into your home makes sure to inspect all cracks that you might find around your foundation and seal the openings. You can install screens over vents that lead to the outside of your house and seal all the openings around the plumbing fixtures that enter and exit your house. Inspect the outside of your house. Locate any opening, crack or crevice that snakes can enter through. Patch the cracks and crevices with caulk. Check for holes in screens, and patch any areas that snakes can use as an entrance into your home. Check for gaps in door frames and around windows and seal with caulk. Snakes love to hide in the dark, quiet crevices of wood piles, so it is important to keep any firewood piles well elevated. It is best to store any lumber or woodpiles at least two feet from the ground, making it more difficult for snakes to make a home in the timber. If they can’t find any place to hide, they’ll move onto another yard. Not only can you use snake repellent to get rid of snakes in your yard, but also mouse and insect repellents to help keep their food supply in check. Doing this will assist you in keeping snakes away from your house permanently. Some of the best repellents on the market are the Pest Rid, Bonide Products, and Snake Repellent Spray. You can also create your own homemade, natural snake repellent with the recipes found below. If you don’t want to buy and use the toxic and harsh snake repellents that you can find in your local hardware store, you can always make your own repellent. Most of the ingredients in homemade snake repellents can be found in your home or you can easily purchase them online or in your local store. Spray the mixture over your plants, along your home’s foundation, and anywhere else you think you might have a snake problem. Reapply often, especially after it rains. If you are having issues with snakes, plant some lemongrass in your yard. Also known as Cymbopogon Citratus, West Indian Lemongrass works great as a natural snake repellent. Snakes can’t stand the citrus smell that the plant gives off and will steer clear of the area. The great thing about lemongrass is it also helps to deter mosquitos and is easy to maintain. Mothballs are a natural snake repellent and can be quite useful for keeping snakes out of your backyard. They contain a chemical called naphthalene that irritates the snakes’ chemical receptors, ensuring they keep clear of the area. Some domestic animals are natural snake deterrents. Certain kinds of fowl, like ducks, chickens, and geese will hunt down stray snakes in your yard and eliminate them. Pigs are also known to hunt down snakes and kill them when they enter their territory. If you are more of a traditional pet owner, some dogs will hunt down snakes and cats will hunt down pretty much anything including snakes and unwanted rodents. Another way to get rid of snakes in your yard is to trap them and relocate them into the wild. You can fashion a simple trap out of a large wooden box or purchase them from online retail stores. You’ll have to locate the den of the snake and block off all entrances and exits except one. Put the trap at the opening and leave it alone during the day. Check the trap to see if you’ve caught anything. If you have, take the snake to a wooded area near your home and release it. If you find a venomous snake, like a copperhead, leave the relocation to the pest control experts. If you haven’t seen a snake in your yard or garden, it doesn’t necessarily mean that you don’t have them. One telltale sign that you might have a snake problem is if you discover a snakeskin in your yard. As snakes grow, they shed their skins, so if you come across one, it might mean you have a snake in your garden. Another sign that you might have snakes in your yard is a high population of voles, moles, crickets, rats, or mice. Many of the snake repellents on the market today contain dangerous chemicals that can be toxic not only to small children and pets but other wildlife that may come in contact with it. If you want to avoid using poisons and harsh chemicals you can always make your own snake repellent out of normal, everyday household ingredients. Here are some of the most effective homemade snake repellent recipes that you can use to repel snakes. While wearing a face mask and protective rubber gloves, place two cups of mothballs into the zip-top bag. Remove all the air from the bag. Seal the bag and lay it on the ground. Walk over the top to crush the mothballs. Using the bucket, mix equal parts kitty litter and mothballs. Toss the mixture with your gloved hands. Scatter the mixture around your property. Make sure to get them in corners, covered areas, and crevices. Mix the ammonia and dish soap. Place in a spray bottle. Spray around your yard, making sure to get it in any crevices or corners. Reapply every couple of weeks. Even though snakes are a positive sign of a strong ecosystem, it can still be rather unnerving to find them in your yard. If you are having trouble keeping snakes out of your yard and home, the simplest thing is to make your yard unattractive to reptiles. Maintaining your yard and following the simple solutions outlined in this article will show you how to get rid of snakes while working in your garden and yard. If you found any part of this article helpful, please pass it onto everyone you know.